Stella Steiner is looking forward to leaving her hometown in Minnesota to attend Berkley in California. Stella just wants to start anew and forget about the intense headaches and visions she experiences. There is no way that she can stop these visions, but she has been lying to her adoptive parents by pretending she rarely experiences them anymore. Stella’s parents are researchers for MONAD, the largest scientific research firm in the world. At Berkley, Stella finds herself reunited with her biological family and learns the truth about her visions. When Stella might be the living proof that immortality can be obtained, she will have to keep herself safe from MONAD. But whom can she really trust? When Stella’s fate seems to be unpreventable, she will have to delve deep into the past to understand her future. This book was unlike most of the books I read and I thought it was a refreshing change for me. The plot is fast paced and original. The spiritual elements and metaphysical themes of the book were interesting and I gained some insight about Buddhism and Scandinavian culture. The reincarnation plotline was captivating, as were the implications of what that would mean for humanity. The first and last chapters were written in the first person, while the majority of the book is written in third person. Choosing the third person was a good call, since it read smoothly and worked better with the alternating perspectives. I liked Stella and Aron and their instant connection with each other. I wanted to know more about them (especially Aron) and their lives before they met each other. Dane never felt like he had much depth, and I hope that his character is developed more in the upcoming books in this series. I liked how the motifs and allegiances of some of the characters weren’t always clear, and that kept me guessing. The ending was unpredictable and kept me on the edge of my seat. 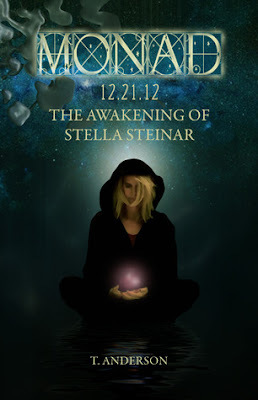 Overall, The Awakening of Stella Steinar had a creative and original premise and an attention-grabbing storyline. I found a lot of the topics in this book interesting, but I was left craving more information about the main characters. The fast paced plot kept me engaged and interested. Unique and creative, The Awakening of Stella Steinar was unlike anything I’ve ever read before. Thank you T. Anderson for sending me a copy to review. "My name will always be Stella. And my fate will always be the same." Thank you Emma, for your honest and constructive review. I'm so glad you enjoyed my book! The next book will give you more of the character information you are hoping for, but will still have you on the edge of your seat. You won't believe what happens next! My book is available free for Kindle on Amazon.com at this link for a limited time. Happy reading!